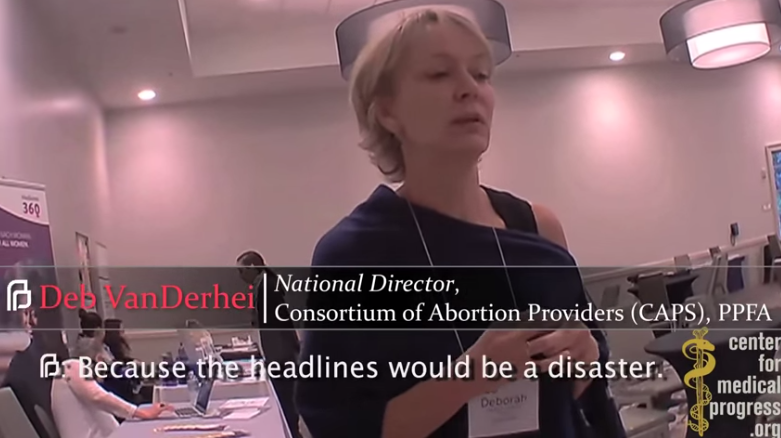 The latest video expose’ released by the Center for Medical Progress shows representatives of the abortion giant Planned Parenthood seeking to keep their involvement in the harvesting and sale of the body parts of aborted babies on the down-low. “I have been talking to the executive director of the National Abortion Federation. We’re trying to figure this out as an industry—about how we’re going to manage remuneration—because the headlines would be a disaster,” Deborah VanDerhei, the national director of the Consortium of Abortion Providers, which is under the Planned Parenthood Federation of America (PPFA). During the conversation, VanDerhei asks who she believes is a representative of a human biologics company–but is actually an undercover investigator–how their company handles compensation. He states that he understands does not have a policy on how abortion facilities are to handle the matter. She later reiterates that it is up to each facility as to how they wish to work with fetal tissue procurement companies. “And if they have smaller margins or don’t have the ability to fundraise because they’re not a non-profit, that’s really helpful,” she explains. “From email black-outs to contorted oxymorons like ‘donation for remuneration,’ the lengths to which Planned Parenthood leadership will go to cover-up their illegal sale of aborted baby parts are nothing less than the desperation of a guilty conscience,” said David Daleiden, Project Lead for CMP in a statement on Tuesday.